TJ Girls’ Soccer was closer to playoffs than recent years and excitement is already high for next season. TJ’s girls’ varsity soccer team made a comeback this season with an impressive ending record of 10-4-1. The team was faced with a new coaching staff, which changed the setting at practices and impacted the team dynamic. The girls previously had four coaches to rely on during practice and games, but this year they only had two. Yantas coached the varsity team and brought in counselor Erin Thompson as the JV coach for her first season. “I loved coaching the TJ team this year, the girls really made the experience great by welcoming me into the position and we were almost like a family by the end of the season,” illustrated Thompson. This created a new atmosphere for the players, and it proved to be successful as it resulted with a better record for the varsity team by the end of the season. After the departure of the previous junior varsity coach, John Thompson (JT), the team had to make alterations, but they ended with a similar record as previous years. “Although I miss having JT as a coach, Thompson has created a new setting which lead to improvement from last year, allowing the junior varsity team to better our skills,” elaborated junior and JV captain Cameron Waters. TJ welcomed seven freshman girls onto the varsity team, more than in previous years, which allowed the positions to be filled after the departure of last year’s seniors. “Last year’s seniors were great and contributed to the team so much, and I was sad to see them leave, but this year’s incoming freshmen really picked up what we lost and allowed the team to grow even more,” explained sophomore Jaelyn Jackson. 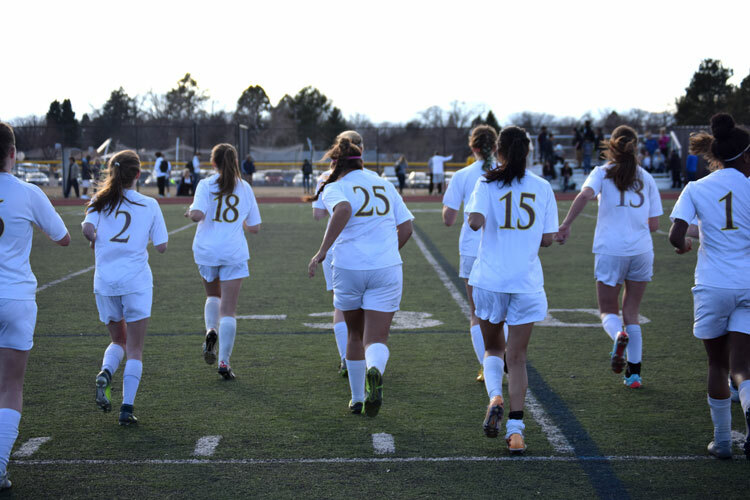 The Lady Spartans were able to win seven more games than last season, including a 9-1 win against West High School and a 4-0 win against Overland High School. Unfortunately, TJ was unable to pull off the win against major rivals South and George Washington. Had they won, these games would have brought the Spartans into the playoffs, but hopes are high to make an even bigger comeback for the 2018 season. “I am very proud of our team’s performance this year and despite being only one spot away from playoffs, I know we will do even better next year, ” said Yantas. This season’s team had the opportunity to compete in Crossovers with other DPS schools, allowing for a longer season than in previous years. Crossovers is a playoff-like competition for schools to determine their ranking by allowing 4A schools to play against lower ranked 5A schools, creating an experience that some schools may not be able to have during the regular season. TJ had its first Crossover game on Friday, April 28th against The Far Northeast Warriors, winning with a score of 9-0. The team then went on to their second Crossover game on May 3rd against Kennedy High School, winning with a final score of 8-1. “I was extremely excited with the successes in Crossovers. I was very happy to see that the versatility that we have been practicing all year really showed during the games,” mentioned Yantas. Although the Spartans were unable to reach playoffs this year, hopes are high they can achieve this goal next season.